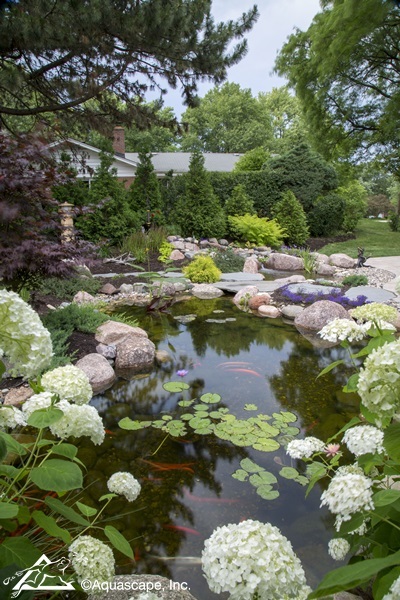 Tips for a Healthy Summertime Pond - Aquascape, Inc. The beauty and joy of a pond makes summer more memorable and relaxing! 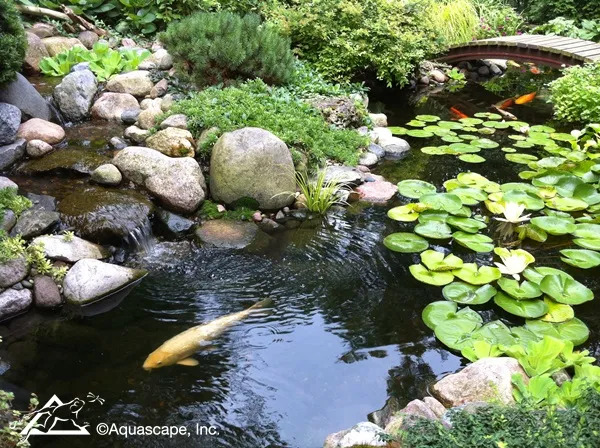 To fully enjoy the “Aquascape Lifestyle,” you want to make sure your water feature is healthy and functioning optimally throughout the warmer months. When water temperature rises above 80 degrees this summer, it’s important to keep a few things in mind. Keep an eye on your fish. Do your finned friends appear stressed out, gasping for air close to the water’s surface or especially close to a fountain or waterfall? Warm water has a low capacity for holding oxygen, while cooler water can hold very large amounts of oxygen. Warm pond water and increased activity go hand and hand, and that increased activity also means your fish require more oxygen when less oxygen is available, thus creating a vicious cycle. Stressed fish often begin to develop diseases, and soon enough you’ll have a domino effect. Add oxygen to your pond by placing an aerator or AquaForce® pump in your pond. You can also install a fountain with a pump if your pond doesn’t have a waterfall or stream. Make sure all areas of the pond are skimmed and the water circulated. And keep in mind that waterfalls, streams, and even fountains play a huge part in the oxygenation of the water in your pond. There are some preventative measures you can take in order to keep your pond from becoming a warm, unhealthy mess. It all starts with a well-designed water feature. Depth, plant coverage, shade, and circulation should all be considered when designing and building a pond. A minimum depth of two feet is suggested; the bottom of the pond will remain cooler. You’ll also want to stock your pond with a lot of plants to provide shade for the fish. A good rule of thumb is to provide plant coverage of approximately 1/3 to 1/2 of the pond’s surface area. Perhaps one of the most important parts of pond design is circulation. If possible, you’ll want to place your biological filter and mechanical filter across the pond from each other, so that your pond receives optimal circulation. The bottom line is that you need to keep an eye on your pond and let your fish and plants do the talking. If you have a balanced ecosystem, you’ll find it much easier to maintain the health of your pond, fish, and plants.